This historic home was built in 1826. The exterior is painted in pastel pink and accented with Robin’s egg blue shutters. On the front porch, guests will also find a pair of comfortable rocking chairs for lounging. Step inside to find glossy hardwood floors, antique furniture and plenty of natural light pouring in from each window. This is a spacious luxury rental with three bedrooms and 2.5 baths, sleeping up to six guests. The private porch in the back is loaded with elegant deck furniture and enclosed with greenery. 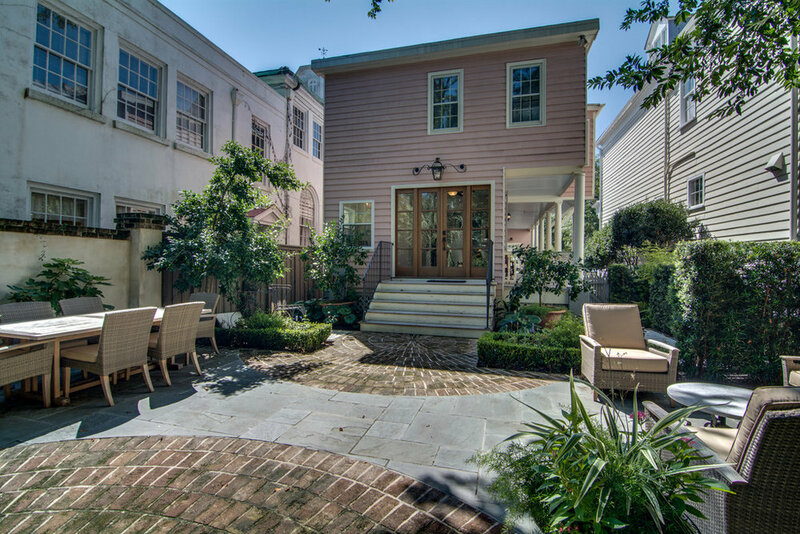 This is a private getaway that is just steps away from Charleston’s iconic Meeting Street! This large, luxurious home features four bedrooms and four baths, sleeping up to eight guests. Built in 1800, the house is located in the Battery Park area of historic downtown Charleston—celebrated for its cobblestone alleyways, harbor views, art galleries and some of America’s top dining destinations. The bedrooms’ doll house decor is tasteful and serene, featuring decorative pillowcases, antique rugs, and bright wallpaper. The upstairs has a large balcony overlooking the back end of the property, which also includes a furnished backyard patio. Please note, this property is only available on a monthly basis. This E. Bay vacation rental offers a one-of-a-kind Charleston experience. Located on the Charleston Harbor, guests can enjoy an incredible view from one of two balconies that face out over the water. With three bedrooms and three and a half baths, this luxury property offers plenty of space, including a large living area that flows into the fully-equipped kitchen. A washer/dryer is available on-site, and street parking for your convenience. This property is only available for monthly rentals, so bypass the extended stay hotels and find yourself in one of Charleston’s most sought after homes. Perfect for seasonal stays or corporate housing! This three bedroom, two and a half bath property can sleep up to six guests, providing a comfortable, cozy stay right in the middle of downtown. Inside the front door, you will immediately feel at home, as you step into the spacious open floor plan. The kitchen features modern amenities with an L-shaped marble countertop and island that’s the perfect spot for coffee or breakfast. There’s also a charming nook next to the gas fireplace for a romantic nightcap or light morning reading before hitting the town. Other homely highlights include a back patio with a gas-fire grill, a washer/dryer, and off-street parking for up to three cars. Want a neighborhood feel while only being steps away from the lively action on King Street? 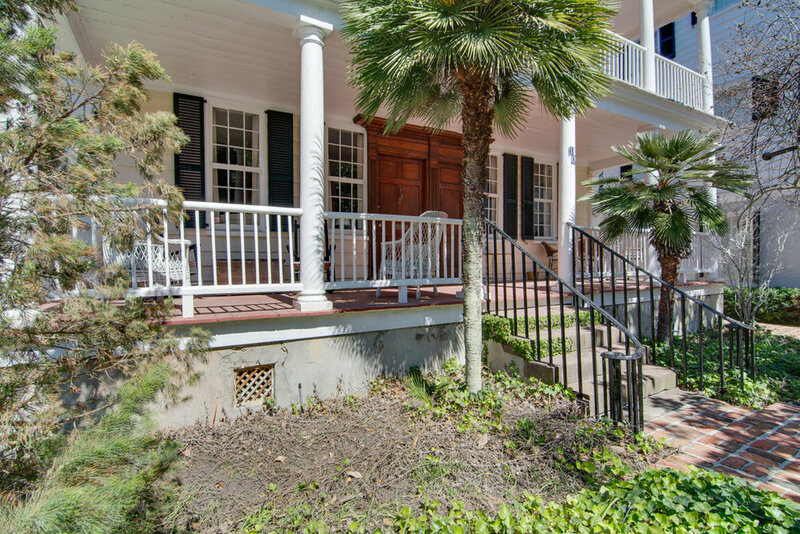 Look no further than this Charleston vacation rental house located on Ashley Avenue. With two bedrooms and two baths, this brightly lit home in the Elliotborough neighborhood is ideal for families or a getaway for friends. The large kitchen/dining area and living room are built out for socializing, offering plenty of seating and a natural flow throughout the downstairs area. The interior design has a strong wooden aesthetic with glistening hardwood floors and darkly-stained bed frames and chests of drawers. This pet-friendly vacation home also offers off-street parking for your convenience. No matter which property you choose, when you book vacation houses for rent in Charleston, SC with Walk Away Stays, you can rest assured that you’ll enjoy a truly luxurious experience. In addition to our charming properties, we go the extra mile with 24/7 concierge services, the highest quality linens, hotel-style toiletries, and complimentary locally roasted coffee. Browse our full portfolio of Charleston, SC vacation houses, and book with us today!